Is the IXUS 1000 HS with its 10x optical zoom and 1080p HD video recording a must-have anniversary edition or a party pooper? Wow, was it really a decade since Canon rolled out the first IXUS? 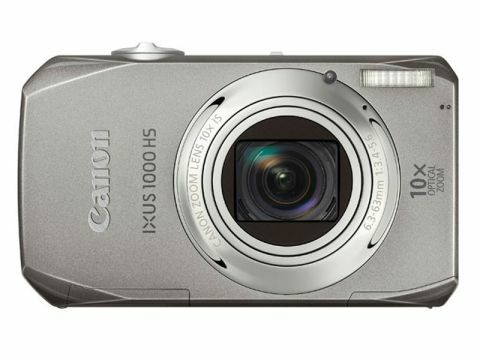 To celebrate 10 years of this stylish compact, Canon has released the IXUS 1000 HS. Compared to the first models, which offered a couple of megapixels and feeble zoom, the IXUS 1000 HS sounds cutting-edge. Its main selling features include a 10 megapixel sensor and 10x optical zoom lens. Canon claims the 10-megapixel IXUS 1000 HS is the slimmest 10x optical zoom compact. The Canon IXUS 1000 HS also offers full 1080p HD video for stereo sound recording, something of a coup in a camera in this price range, as well as a 6.3–63mm (35 mm equivalent: 36 – 360 mm) f/3.4 - 5.6 lens. What's more, Canon has made this a high-sensitivity model as ISO can be pushed as far as 6400, 3200 in full resolution. Last but not least, the IXUS 1000 HS has a 3in, widescreen-ratio (16:9) rear LCD. However impressive the IXUS 1000 HS sounds on paper, compacts have moved on massively since the first IXUS appeared, and it's facing some tough competition from the Panasonic Lumix DMC-TZ8, the TZ10 and the Sony Cyber-shot DSC-TX5. Read on to see if this £280 camera (street price) lives up to the anniversary hype.